After initially failing to inflate the pad from totally flat by mouth, I staggered to the incorrect conclusion that I needed some artificial means of inflation – hence the post about making an adapter for a Platypus bottle (which would work). Somewhere in there I bought a pack of Pope 4mm Sealing Plugs (possibly .1 grams each!) and decided to have another go. The inflation difficulty is caused by some narrow air channels along the top of the pad. You can easily infate the larger tube on the side. 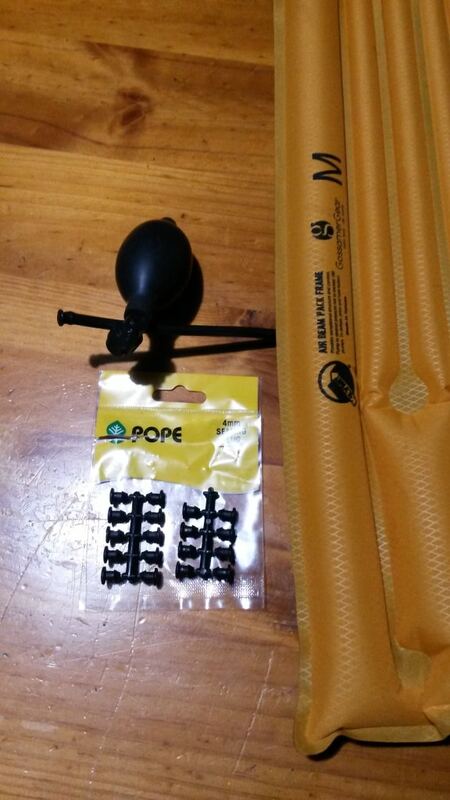 When you do that you can squeeze the air around these narrow channels after which the pad inflates easily by mouth. Conclusion: you do not need to carry the pad inflater bulb, a saving of one ounce (28 grams – a Muesli bar or spare phone camera, etc). Mountain Laurel designs have (no longer) their own version of this pad in a configurable format (http://www.mountainlaureldesigns.com/shop/product_info.php?cPath=46&products_id=186) – US$35. 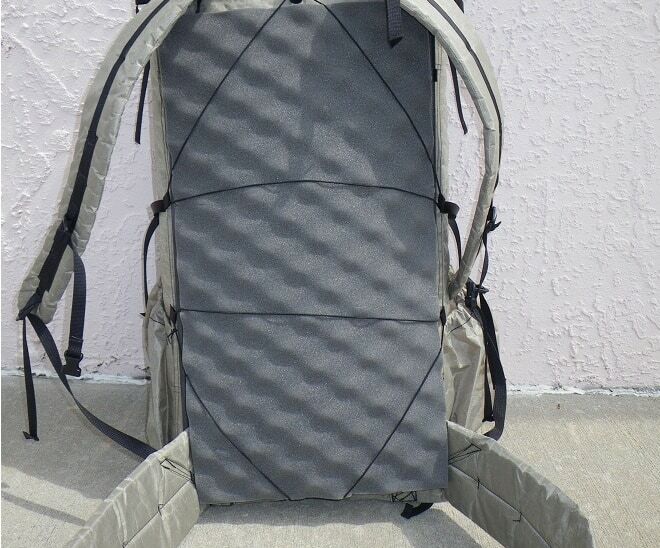 They also offer a pad pocket option which is great for load transfer: (http://www.mountainlaureldesigns.com/shop/product_info.php?cPath=25&products_id=208) – US$45. The pad + pocket add about 120 grams. We added this system ourselves with some flat elastic to a pack with spectacular results, not least being a dry back! Mountain Laurel Designs (no longer) ave a load transfer system (http://www.mountainlaureldesigns.com/shop/product_info.php?cPath=25&products_id=208 using a Klymit pad which goes inside your pack). You could try this anyway if you aren’t handy at sewing. I suspect the idea originated first with Ray Jardine (http://www.rayjardine.com/ray-way/Backpack-Kit/index.htm?g_page=9). I prefer it on the outside of my pack for the dry back option, what a winner! and as a handy trail seat for rest stops.